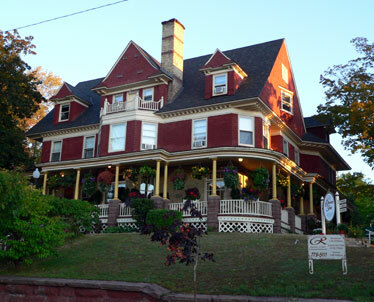 The Old Rittenhouse Inn, a restored mansion providing food and lodging in Bayfield, Wis. It was a good sunrise. It was a true sunrise. Hemingway would have liked it. I was on the shore of Lake Superior in Bayfield, Wis. -- not exactly Hemingway country -- but as I was on my way to trace one of his youthful paths in the neighboring Michigan Upper Peninsula, I didn't figure Ernest would take offense. I've said before that I prefer traveling with friends to being alone, but there's something romantic and daring in the thought of solitary wandering, and many travel classics focus on the conceit of one person adrift in a new world, antennae extended to maximize adventure. My friend Peter Esser, a more traveled guy than I -- who loves retracing the fabled footsteps of itinerant literary explorers like Somerset Maugham or Gavin Young -- swears by the credo of William Hazlitt: "One of the pleasantest things in the world is going a journey; but I like to go by myself. I can enjoy society in a room; but out of doors, nature is company enough for me. I am then never less alone than when alone" (From "On Going on a Journey," 1822). I tried to remind myself of that as I ate a perfectly fine dinner alone at the Old Rittenhouse Inn, the only single among a dining room full of happy couples, families and friends, and perhaps "known (as Hazlitt would have preferred) by no other title than the gentleman in the parlour." Not having a book to pass the time between courses, I took a few notes and tried to imagine the life stories of those around me. But I wouldn't have minded a little idle conversation. From the Miner's Castle overlook, you can get a look at the Pictured Rocks, 42 miles of brilliantly colored sandstone cliffs north of Michigan's Upper Peninsula. The ride up from Madison had been pleasant enough, some 325 miles through central Wisconsin and the North Woods on a sunny mid-September day. It was a little early for fall colors, but the farther north I drove in tracing Hemingway's footsteps, the more golds and reds I spied. A highlight was my second lunch stop in four years at Minocqua's La Baguette bakery and cafe, a delightful shop run by Carine and Olivier Vigy, affable Parisian transplants with a love of the far north; my only disappointment was that they had baked none of my favorite mille-feuilles that day, but I was consoled with a chocolate tart. Getting there: Northwest and American fly into Marquette on the Michigan Upper Peninsula. Several airlines offer one-stops to Madison, Wis.
» Old Rittenhouse Inn, Bayfield, Wis.: Charming rooms in restored mansions, most with fireplace and view. Excellent restaurant. Doubles $155 to $305. Call (800) 779-2129 or book online at www.oldrittenhouseinn.com. » Sunset Motel on the Bay, Munising, Mich.: Close to Pictured Rocks National Lakeshore and the only motel (of many in Munising) on the water at 1315 Bay St. Doubles $56 to $68. Call (906) 387-4574 or book online at www.sunsetmotelonthebay.com. » Old Rittenhouse Inn, Bayfield: Five-course prix fixe dinner, $49. Specialties include Lake Superior trout, and lamb. Extensive wine list. » The Up North Lodge, Gwinn, Mich.: "Almost World Famous Ribs" at 23.95 full rack; Friday night walleye fish fry. Call (906) 346-9815, www.theupnorthlodge.com. » The Brownstone Inn, Au Train, Mich.: At Highway M-28 near Munising. Lake Superior whitefish ($14). Call (906) 892-8332. » Crossroads Bar and Restaurant, 900 County Road 480, Marquette, Mich., (906) 249-8912. Pasties and "Best Fish Fry in Marquette." Thursday is Bikers' Night. » Sportsman's Restaurant, Grand Marais, Mich., (906) 494-2671. Good lunch stop; Lake Superior whitefish and chips (under $10); wavy floor and old hardwood bar; hunting trophies and rural memorabilia. » "The Big Two-Hearted River" can be found in "The Complete Short Stories of Ernest Hemingway" (Scribner, 1998). The next morning I attended to that sunrise, having the dock almost to myself in the chilly pre-dawn hour. The only activity was the early morning ferry to Madeline Island, just a mile across the lake, plus a ship or two plying the channels between the further Apostle Islands. The sun came up behind a spooky fog bank that periodically engulfed the ferries and islands, helping to mute the deep oranges, golds and blues that filled the sky and reflected off the calm waters. There is perhaps, I thought, more truth in a sunrise than in a lifetime of introspection, but it's fleeting. The day intruded. I had to hit the road. The Michigan Upper Peninsula feels like it ought to be part of Wisconsin, to which it's attached, rather than Michigan, to which it's not, but oddly enough the historical arguments seem to give Ohio more of a claim. It doesn't matter too much, though, because the residents of the U.P., "Yoopers," seem to have their own identity, nurtured in part by the area's rugged northern isolation. This was to be another solitary day on the road, but by dinner time I would at last have company, as I was meeting some old Hawaii friends, Nina and Phil Bogetto, at their summer home on Little Shag Lake near the town of Gwinn. Drawn as I am to extremes, I decided to trace as much as I could of the U.P. 's northern shoreline, including the Keweenah Peninsula, which jabs like a finger some eighty miles into Lake Superior. As often happens in September, my favorite month to travel, the weather gods granted me a perfect late summer day, and I stopped often along the wooded roads of the peninsula to take in the beginnings of fall coloration. The trees were still mostly green, but the dark reds of the early-changing maples began to assert themselves more the farther north I drove. With the exception of the twin cities of Hancock and Haughton, about halfway up, the Keweenah is pretty sparsely populated, given over mostly to second-growth forests, small gemlike lake, and quite a few rivers. Highway 26 avoids the coastline for most of its length, but at Phoenix it swings north and hugs the coast for the last 24 miles to Copper Harbor, where it meets Highway 41 looping back south to Phoenix. This is vacation country, and Copper Harbor is a vacation town, but I was surprised at how few tourists I actually saw. The many beaches were all but deserted, in spite of the good weather, and quite a few local businesses were already closed for the season. I stopped often to take photos and admire the quiet shoreline. At Big Sand Bay, not far from Copper Harbor, the sun-drenched beach was enveloped in an ominous cloak of fog. The lake seemed welcoming, however, and while it might conjure up legendary storms, that day it was like a sheet of blue-green glass. Large as a sea, Lake Superior can on such days appear to be just another big lake, but the sight of 800-foot freighters hugging the coastline quickly brings things into perspective. As enjoyable as my drive up the Keweenah was, it illustrated just why I prefer accompanied travel: Save for ordering a quick lunch, I didn't exchange a single word with another person. Not that I can't carry on a perfectly good conversation with myself, but occasionally I prefer unexpected answers to my questions. And, besides, Hemingway never made it up there. With that in mind, I beat a hasty retreat to Gwinn and the old friends awaiting me there. After a barbecue rib dinner at the "Almost World Famous" Up North restaurant, a couple of glasses of good wine, some conversation and a night's sleep, Nina, Phil and I were ready to find Hemingway country. But first we decided to drive back to the Lake Superior shore to visit Pictured Rocks National Seashore and points east. After a stop in nearby Munising and the Interagency Visitor Center, we drove to Miner's Castle overlook to get a first look at Pictured Rocks and the neighboring Grand Island National Recreational area offshore. The Castle is actually the lake shore's iconic natural landmark, a distinctive rock formation overlooking a clear shallow inlet. Though these formations seem eternal, just a few months before our visit, one of the two rock turrets that gave it a castlelike appearance collapsed and fell into the lake. Walking on the edge definitely took on a different character after learning that. 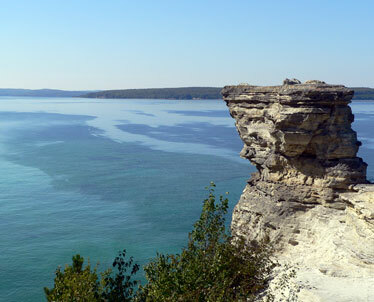 Established as the first national lake shore in 1966, Pictured Rocks is the name given to 42 miles of brilliantly colored sandstone cliffs, ranging from 50 feet to 200 feet in height, that grace the north shore of the U.P. It's possible to hike the seashore's 90 miles of trails or to camp in the back country, but the cliffs themselves and the many beaches interspersed among them are easily accessible by car and short walks. We took a couple of those short hikes, including a mile walk on the Grand Sable Dunes trail that led, after a climb through the dunes, to a spectacular view of the lake shore. Sitting at the eastern end of the lake shore, the little town of Grand Marais was a natural place to stop for lunch and a walk on the beach. Grand Marais, built around a perfect little harbor, is a tidy tourist town fairly close to the Big Two-Hearted River, the supposed setting of Hemingway's famous U.P. story. We ended up having lunch at an interesting bar and grill called Sportsman's Main Stop, which, while it's not likely to get a Michelin star any time soon, did have excellent whitefish and chips, plus an old, buckled wooden floor so wavy that it probably chastened a lot of the late-night drinkers. So, after lunch we finally tried to track down Ernest. 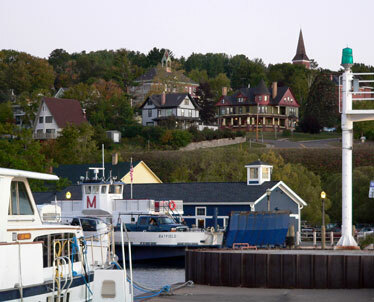 Harbor life is a given in Bayfield, Wis., on the banks of Lake Superior. THOUGH Hemingway spent a lot of time in Michigan, it was mainly in lower Michigan at his family's summer home on Walloon Lake in the Charlevoix-Petosky area. He did visit the U.P. at least once, in 1919 while recovering from his war wounds, and this visit was later memorialized in one of the Nick Adams stories, "The Big Two-Hearted River," set in the town of Seney. Hemingway actually wrote the story in 1922 in a Paris cafe, as he later recounted in "A Moveable Feast." A paean to fly-fishing, solo travel and roughing it, the story is classic Hemingway, even if it was in great part fiction. 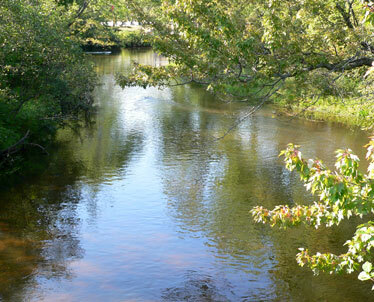 First of all, the real Big Two-Hearted River is many miles from Seney, and Hemingway probably never saw it. It's clearly a sexier name than the Fox, which does run through the town, but, after all, the Nick Adams stories aren't advertised as anything but fiction. More important, at least to me, was the fact that when Hemingway did visit Seney to fish the Fox, he wasn't alone. He was traveling with a couple of pals. Point taken about solo travel. Around the turn of the 20th century, Seney was a bustling logging center once referred to as "hell town in the pine" with 13 saloons, three hotels, 11 houses and lots of hyperactive lumberjacks. Today -- and likely when Hemingway visited -- it's a pretty quiet place, with a few stores and a couple of motels. The saloons and hotel are long gone, and the only landmark remaining from the story is the old railroad station, which has been turned into a tiny museum featuring a display case and a few photos memorializing young Ernest's visit. Unfortunately, it was closed when we arrived, but we could see what we needed through the front window. The Fox River was the inspiration for Nick Adams' "The Big Two-Hearted River." Surprisingly, when I asked at a couple of stores about the Hemingway connection, I was greeted with blank stares, and I couldn't even find a town postcard. Sic transit gloria. In the story, Hemingway described walking a hundred yards from the station to where the river -- in this case the east branch of the Fox -- crosses the right-of-way, and, sure enough, it's still there, though it's barely more than a creek. Never mind. Papa trod this ground, and so did we. I suppose there's a limit to how far one wants to follow his literary trail. After all, I regretted my youthful visit to Harry's Bar in Paris, a dusty, overpriced tourist trap that made me feel guilty about visiting. Yet walking along the banks of the Fox seemed a good thing to do, especially as nobody was trying to sell me anything. The drive back to Little Shag Lake took us near the Seney National Wildlife Refuge and then to the outskirts of Marquette, the U.P. 's largest city and home to a branch of the state university. Rather than go out to dinner, we decided to take home some of the local culinary favorite, the pasty -- basically meat, potato and vegetables rolled in pastry dough -- originally brought to America by Cornish miners and adopted by the Finns and Swedes of the U.P. That proved more difficult than we imagined, given the hour, but we finally managed to find some at Marquette's Crossroads Bar and Restaurant, reputed also to have the best fish fry in town. Keep in mind, though, that Thursday is "Biker's Night." Next day I was back on the road by myself, heading south by way of the Lake Michigan shore with just one more stop on the way to Madison, at a place I have long wanted to visit: the Peshtigo Fire Museum. You would be forgiven if the name "Peshtigo" draws a blank, but on Oct. 8, 1971, the same night as the famous Great Chicago Fire, the little town of Peshtigo in Northern Wisconsin also suffered a fire that is likely the most destructive in American history; while perhaps 300 perished in the Chicago Fire, between 1,200 and 2,400 died as a forest fire swept through Peshtigo. The small museum commemorating the fire occupies a former church and sits next to a cemetery with the graves of many victims and heroes, the only visible evidence remaining of that great tragedy. There are times when one needs to pay respects. And so it was a good finish. It was a true finish. Hemingway would have liked it. James Dannenberg is a retired District Court judge who lives in Kailua. His tales from the road have appeared in the New York Times and the Los Angeles Times.